They are rich fudgy brownies baked on a buttery shortbread crust. Before the first time I made them, it never occurred to me that brownies would benefit from a crust, but ever since, it has seemed as natural as adding chocolate chips to a cookie. They are adapted from chocolate genius Alice Medrich’s book Bittersweet (recently re-released as Seriously Bitter Sweet). Her books are the first ones I turn to when I’m looking for anything chocolate, from truffles to tarts to mousses to cakes to brownies. She’s never steered me wrong. 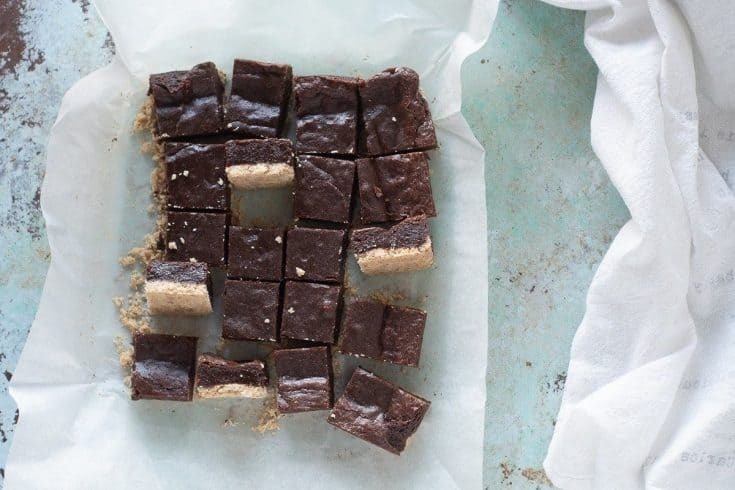 These shortbread brownies are a study in the pleasure of contrasts. The brownie part seems smoother and more chocolatey against the crisp almond shortbread background. They are almost like handheld chocolate tarts. Even better, they are incredibly easy to make. 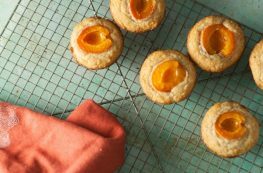 The shortbread crust is a simple pour-melted-butter-over-flour-almond-meal-and-sugar, stir, and pat-in-the-pan job. It gets baked until golden while you put together the brownie batter. You melt the chocolate and butter and sugar together over a pan of barely simmering water, and then stir in the eggs, vanilla, and flour. 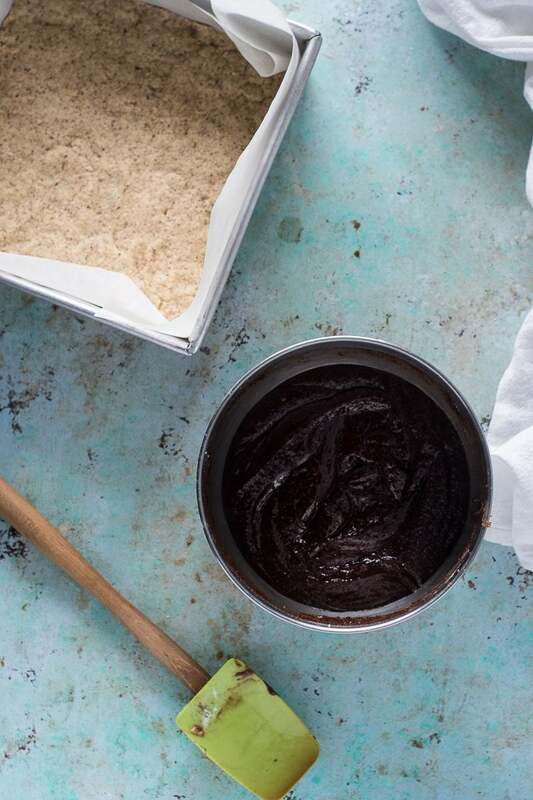 Since they have so little flour, these brownies do need some serious stirring, but it still only takes a couple of minutes. Then you pour the batter over the shortbread crust and bake until the edges are puffed and the middle is set. I’ve made many variations on these over the years. I’ve omitted the nuts for friends with allergies, I’ve swapped in ground hazelnuts for the almonds, I’ve added a caramel layer to the top of the brownies, I’ve sprinkled them with sea salt, I’ve dusted the top with the faintest hint of freshly grated nutmeg. I’ve yet to find a version of these I don’t like. 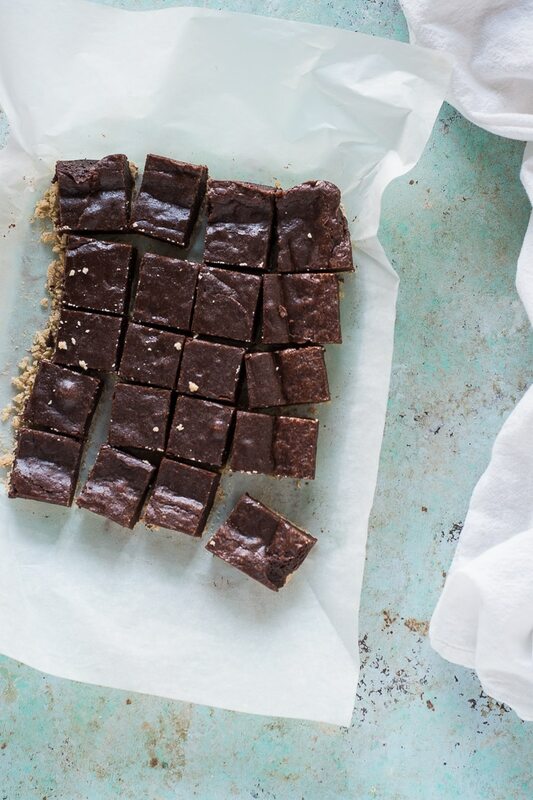 These brownies are, pretty much, unanimously loved when I bring them anywhere. People sometimes ask me what they are and look at me with incredulity when I say they’re brownies. As though something this good can’t just be as simple as a brownie. Rest assured, my friends, it can. These brownies are one of my favorite easy-to-make desserts. 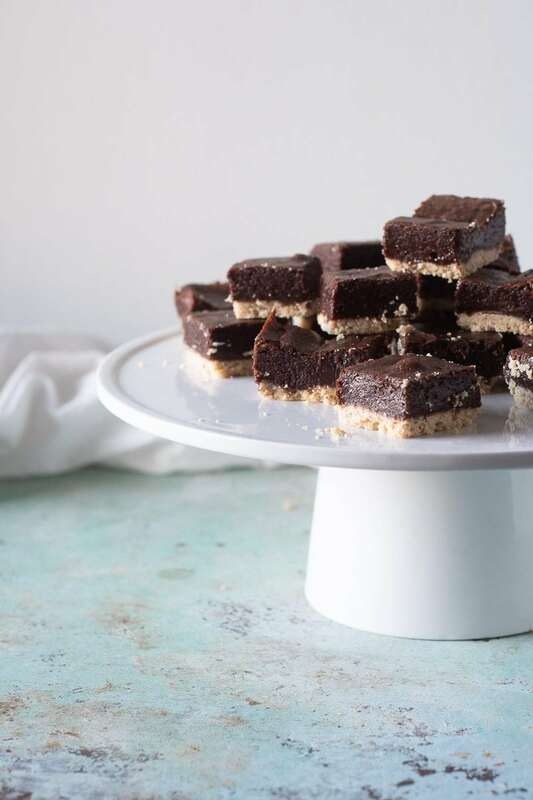 They manage to combine the decadent pleasure of a fudgy brownie with the crisp, buttery, nutty texture of almond shortbread. You can pulse almonds in a food processor to make almond meal if you don’t want to buy it separately. Or you can omit the almond meal completely if you want to avoid nuts. These are quite rich, so cut them small. You can always have a second one. Preheat oven to 350°F. Line a 9-inch square baking pan with parchment paper or aluminum foil with enough overhang on two sides to be able to lift it out after everything is baked. Combine the flour, almond meal, sugarm and salt in a small bowl. Add the vanilla extract to the melted butter and pour over the flour mixture. Stir until it comes together. Press the dough into the bottom of the lined pan in an even layer all the way to the edges. Bake for 15-20 minutes or until the crust is golden brown. 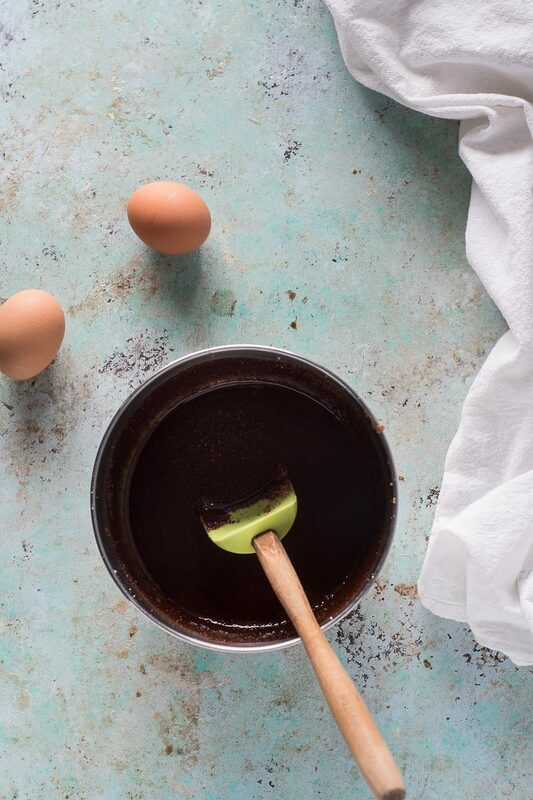 Set aside to cool while you make the brownie batter. Add some water to a wide skillet and bring it to a low simmer. 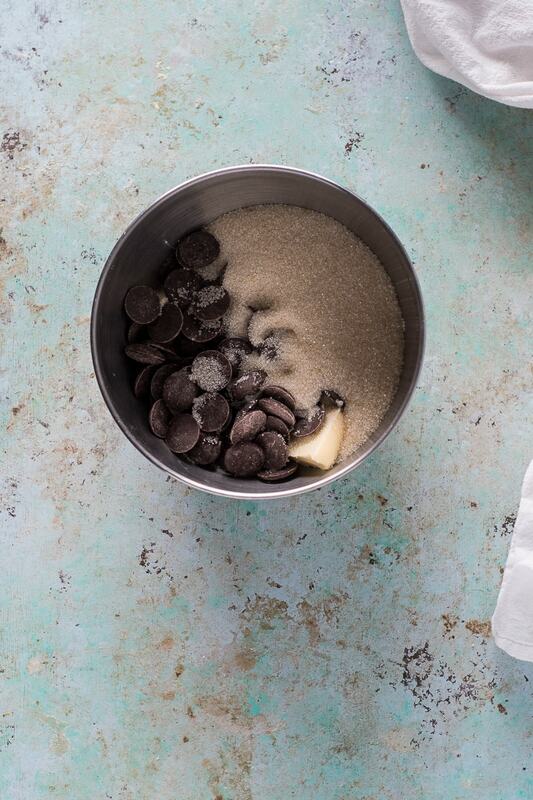 Place the chocolate, butter, and sugar in a medium heat-proof (stainless steel is a good choice) bowl and set the bowl in the skillet. Stir until the chocolate and butter are completely melted and the mixture feels hot to the touch. Remove the bowl from the skillet (wipe the bottom with a towel to prevent any drips) and turn off the heat. Add the vanilla extract and salt and stir. Add the eggs, one at a time, until incorporated. Add the flour and stir until the batter is smooth and glossy and pulling away from the sides of the bowl. If you’re not sure, keep stirring. This should take about two minutes. Pour the batter over the shortbread crust and bake until the edges look puffed and the surface in the middle looks dry, about 20-25 minutes. 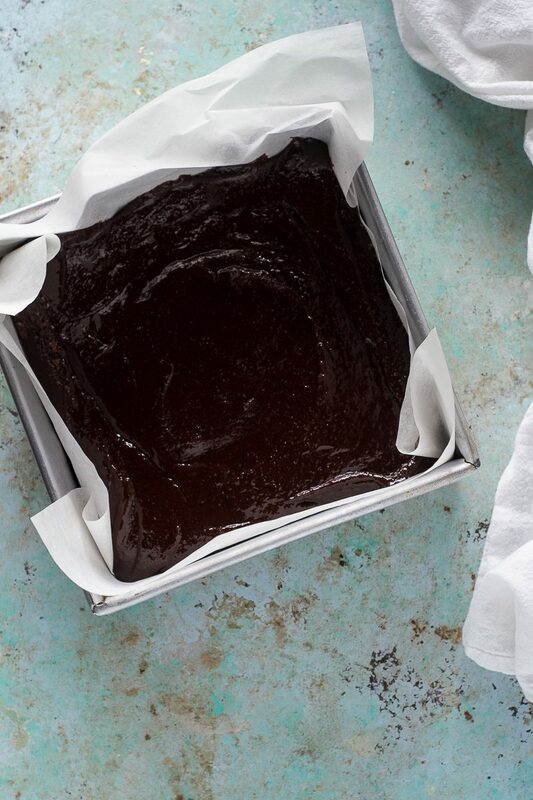 Allow the brownies to cool completely in the pan on a cooling rack. At least an hour. Lift the brownies out of the pan by holding onto the overhanging edges of parchment paper or foil. Using a sharp chef’s knife, cut into 25-30 squares. These are rich, don’t be tempted to cut them larger. They keep well in an airtight container for about 4-5 days. Thanks for the recipe! Just made these (for a visioning session/mission statement drafting exercise I am subjecting my staff to tomorrow– so these are basically an attempt to bribe people into something resembling cheerful compliance) and if Erin’s reaction to “helping me eat the deformed ones” is any indication I may only get about 2/3 of the batch out of the house tomorrow. I love brownies, and this recipe looks one of those that I would make in a few days. Thanks for sharing! I’ll post it on my Facebook page. Looks delicious!!! Daria, I just switched to a new recipe plugin and the chocolate amount must have gotten lost in the conversion process. Gah! 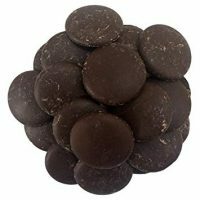 I’ve updated the recipe to include the appropriate chocolate amount, which is 6.5 ounces (185 grams) chopped bittersweet chocolate. 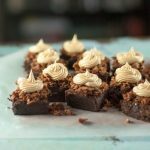 A great tasty twist on a typical brownie! These sound so good. Love the mixture of textures This is perfect to take to a potluck or get together! Yum, I agree what a great textural combination. There’s a treat I grew up with that we called Millionnaire’s shortbread – shortbread base, topped with a kind of caramel then chocolate. While different, this reminds me of that a little with the mix of flavors and textures. Sounds delicious! Just when I thought brownies couldn’t get any better haha! 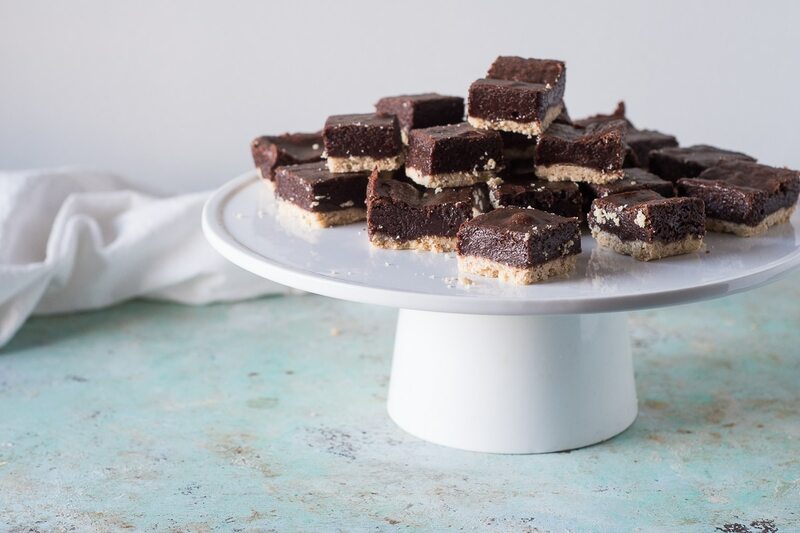 These shortbread brownies are incredible! You had me at brownies and then you mentioned shortbread! Haha! So loving this recipe! Thank youuu! Would gluten free AP flour be ok to substitute in both the cookie and brownie? Thanks so much!!! I’m confident these would work with a gluten free AP flour blend like Cup 4 Cup or Bob’s Red Mill 1-to-1 in both the brownie and the shortbread part. I hope your daughter loves them.